Please note that the content of this book primarily consists of articles available from Wikipedia or other free sources online. Jacqueline MacInnes Wood (born April 17, 1987) is a Canadian actress perhaps best known for her role as Steffy Forrester on the long-running American soap opera The Bold and the Beautiful. She is also known for her role in the Disney XD television movie Skyrunners and appeared in the thriller Final Destination 5. 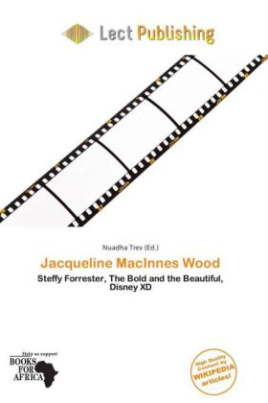 Jacqueline MacInnes Wood (born April 17, 1987) is a Canadian actress perhaps best known for her role as Steffy Forrester on the long-running American soap opera The Bold and the Beautiful. She is also known for her role in the Disney XD television movie Skyrunners and appeared in the thriller Final Destination 5. Wood made a name for herself playing the part of the "hair girl" on a commercial for First Choice Haircutters. In May 2008, she booked the contract role of Steffy Forrester, daughter of Ridge Forrester (Ronn Moss) and Taylor Hayes Jones (Hunter Tylo), on the American soap opera The Bold and the Beautiful.